Learn about the Six Indigenous Seasons at a Play Space located in Burswood. This play space has won an Award of Excellence. Never has play been provided for in Perth on such a large scale, with such variety and such thoughtfulness as has been done at the Stadium Parklands. The Parklands incorporate collections of play environments that will appeal to visitors while at the same time broaden their appreciation of nature, culture and diversity. The designers started by asking representatives of the Whadjuk people how they’d like their culture to be represented. They asked the ‘7 Senses Foundation’ how to address inclusivity of ability. They asked artists how stories could be woven into the play experience. They asked risk consultants and the Royal Life Saving Society how to facilitate play while surrounded by deep waterways. The resultant design reflects the ability of the design team to listen and apply their learnings through an extremely well-considered offering of play environments. 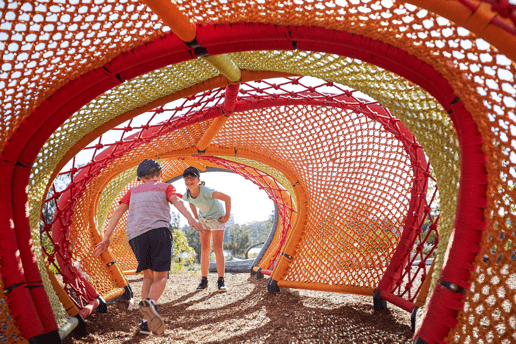 Chevron Parkland comprises six play zones, each representing one of the six Noongar seasons – Djeran, Makuru, Djilba, Kambarang, Birak and Bunuru – through indigenous planting palettes, local materials, nature-play themes, art and interpretive educational signage. The judges were impressed to see the use of loose natural materials and generous informal planting zones that allow children to become the stewards of the space, shaping its form and character over time. Equally impressive is the thoroughly considered inclusive sensory play space sited adjacent to the new bridge as an alternative to the nature play environments.